I purchased two beautiful snapper fillets with intentions to use them in an Asian-inspired dinner that could be made in a snap. 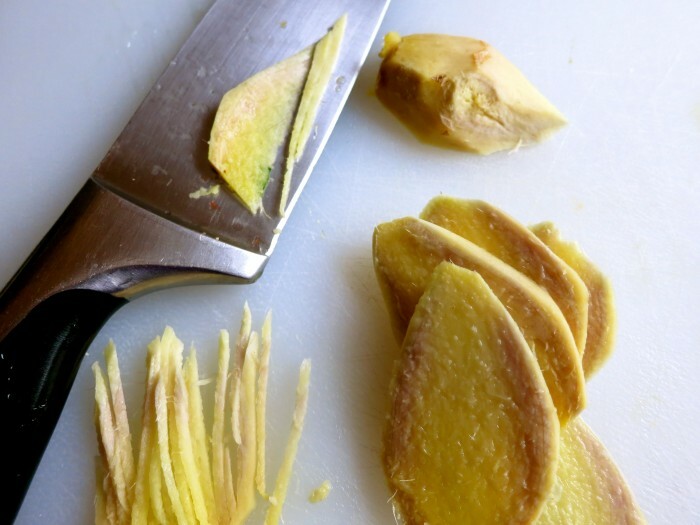 A knob of fresh ginger worked double-duty in the following recipe; I peeled the ginger, julienned it (see picture), then macerated the ginger in rice wine vinegar. After a couple of hours, the vinegar began taking on the perfume of the ginger, which I used in a marinade. After removing the ginger from the vinegar, I fried it until crispy in peanut oil and used it to top the finished salmon. Asian flavors are marvelous with snapper and the following method is a low-labor, max-flavor recipe. If time does not allow for maceration, just skip the step – you’ll still have a delicious dish. 1. If time allows, macerate (soak) julienned ginger in rice wine vinegar at least 2 hours and up to 24 hours. 2. Remove ginger from vinegar, pat dry, and reserve. 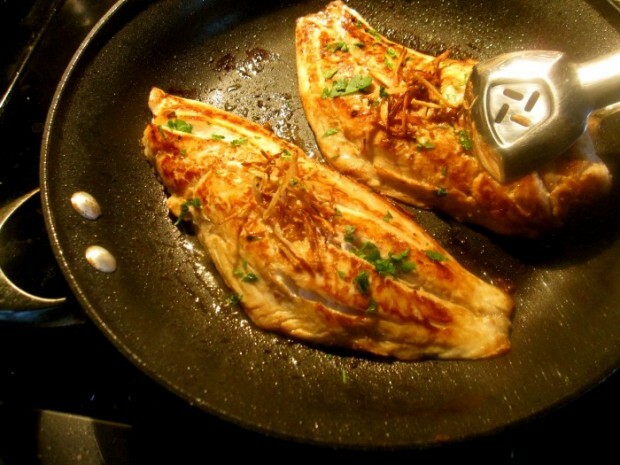 Combine vinegar and soy sauce and let fish flesh marinate in mixture, at room temperature, 30-40 minutes. 3. While fish is marinating, in a large skillet, heat oil over medium high heat. Fry julienned ginger, stirring, until golden brown and crispy. Remove from pan and reserve. 4. In same pan, place fish fillets, flesh side down, and fry until nicely browned, about 4 minutes; alternate the heat between medium and medium high heat so the fillets sizzle but don’t burn. 5. Turn fillets over and brush flesh side with garlic, and continue cooking 3 to 4 minutes or until flesh is white. Garnish with fried ginger and parsley, if using, and serve. More Recipes Filed Under "Seafood"
Easy Green Finish for Flavor Explosion! for your exgirlfriend’s benefit, and for the future of any relationship you might have. understand, unsure if this was Mr.
ti rispondo da qui perchÃ¨ su non si puo piÃ¹.La questione mi Ã¨ chiarissima, ma ti ripeto, e allora?!? Vuoi chiudere tutto il resto perchÃ¨ il rapporto percentuale tra fondi erogati e giocatori convocati Ã¨ nettamente a favore di Treviso? Ripeto inoltre che nel XV titolare uno meno della metÃ , al momento, non gioca per Treviso e se ci metti che ci sono fuori per infortunio Bortolami e Biagi puoi capire che la situazione puÃ² ancora cambiare a &#ae20;f8vor2” dei non trevigiani.